Opening times Mon–Fri 8am–7pm; Sat 9.30am–6pm; Sun 10am–5pm. 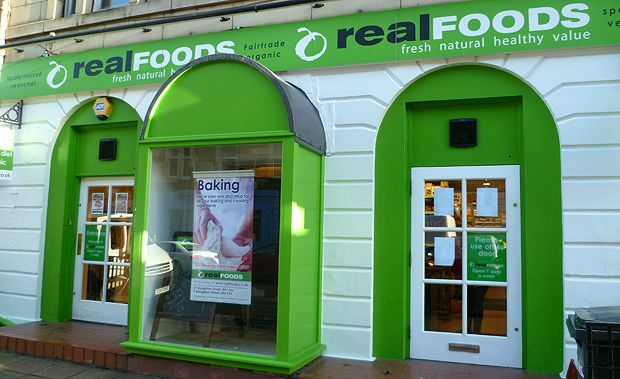 Since opening on Broughton Street in 1975, Real Foods has been at the forefront of natural, organic and vegetarian food in the capital. With the second, Tollcross branch now over 30 years old, the business has expanded to boast over 10,000 health and wholefood lines, while keeping true to innovations like their popular self-service oats, cereals and flour sacks, which give total control over how much customers buy. Both outlets have a vast array of vitamin supplements, pulses, dried fruit and nuts. Fresh organic fruit and vegetables are available as well as wines (either organic, veggie or sulphite-free), mostly local beers, Asian and international foods, organic bread from Garvald bakery, ecological toiletries and household cleaners and a host of other fresh and dried food. Ever-enterprising with retail initiatives, they run a free customer card scheme that gives a 10 per cent discount for early-bird shoppers from 8–10am on weekdays (9–10am on Sat, 10–11am on Sun).